All our girls and boys are drawn into musical activities during their time at school, with specialist Music lessons from Year One upwards taken by our Director of Music. Recorder lessons form part of the curriculum from Year Two upwards with children learning musical notation. Our Upper school girls have the option of taking individual music lessons on the flute, ‘cello or violin. Girls achieve success in examinations with The Associated Board of the Royal School of Music and London College of Music Examinations. 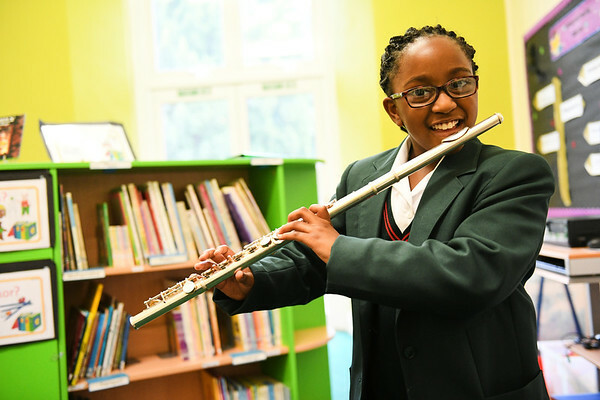 It is hard to capture the full extent of the school’s musical life, with girls in Upper School involved in choirs, recorder groups and an instrumental ensemble. All musicians are encouraged to perform in school concerts, House Music competitions and to make music in venues such as the Grand Theatre, Wolverhampton and the Genting Arena in Birmingham.